Who says only the Easter Bunny brings colored eggs? The St. Patrick’s Day Leprechaun (i.e., you) can also bring them. We loved these designs from Terra’s Kitchen, a healthy meal delivery service. You can make them for the family, or get everyone involved in designing. Here’s how to make fancy colored eggs. 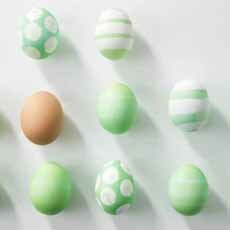 Make green hard-boiled eggs for St. Patrick’s Day (photo courtesy Terra Kitchen) | Facebook.